Let’s pursue Example 3 from above. We have a hypothetical data file, intreg_data.dta with 30 observations. The GPA score is represented by two values, the lower interval score (lgpa) and the upper interval score (ugpa). The writing test scores, the teacher rating and the type of program (a nominal variable which has three levels) are write, rating and type, respectively. Let’s look at the data. It is always a good idea to start with descriptive statistics. Note that there are two GPA responses for each observation, lgpa for the lower end of the interval and ugpa for the upper end. We can compare the means of the variables by each type of program using by. We will use the survival package to run the interval regression. First we setup a survival object that contains the censored intervals using the Surv function. Note the special event status code, 3, used for all observations indicating that all had interval censoring. Then we estimate the model using the survreg function. At the top, the call that careated the model is echoed, followed by the table of coefficients containing the interval regression coefficients, their standard errors, z-values, and p-values. The coefficients for write and academic are statistically significant; the coefficient for rating and general are not (at the .05 level of significance). At the end, it indicates the distribution assumed, here Gaussian, followed by the log likelihood of the model and an intercept only model, as well as a likelihood ratio chi square test of the overall model. The test on four degrees of freedom is statistically significant indicating the overall model is significant. The variable write is statistically significant. A one unit increase in writing score leads to a .005 increase in predicted GPA. One of the indicator variables for type, academic, is also statistically significant. Compared to vocational programs, the predicted achievement for academic programs is about .71 higher. To determine if type itself is statistically significant, we can examine an analysis of deviance table, which is shown below. The ancillary statistic Scale (and Log(scale), the natural logarithm of Scale) is equivalent to the standard error of the estimate in OLS regression. The value of 0.29 can be compared to the standard deviations for lgpa and ugpa of 0.78 and 0.57, respectively. This shows a substantial reduction. The output also contains an estimate of the standard error of the Log(scale). We can get a test of the overall effect of type by examining an analysis of deviance table, which reports the sequential deviances (-2*LL) adding one term at a time. The two degree of freedom test for type indicates that it is statistically significant. Now let’s make a 3d plot of the data and the predicted regression planes. We will put the two continuous predictors on the X and Y axis, and the outcome on the Z axis. Then we will use different colours to code the program type. To do this, we will use the rgl package. Finally because it is difficult to see a 3d image in two dimensions, let’s make it an animated image so we can see it from different angles. For the final part, the free software, ImageMagick is used by the rgl package behind the scenes. 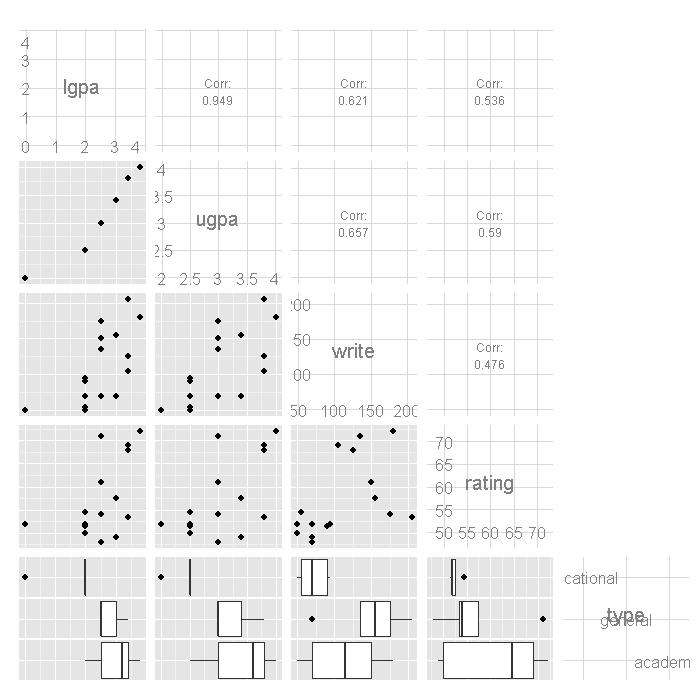 It is not a true R2, but we can get a rough idea by computing the correlation between the expected values from the model and the lower and upper bounds of gpa, lgpa and ugpa. Then the squared correlation is something like an R2.